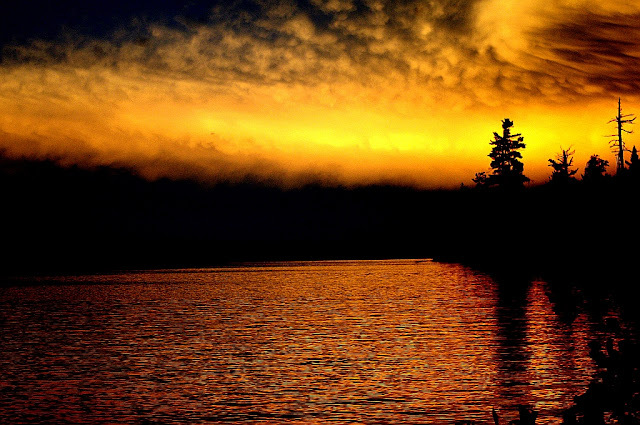 Our wilderness by "American grouch"
Take your time to read it, let it soak in and think about it..... You really should. but every day life and some old stuff I got real cheap! So instead of great pictures and a good story of outdooractivities, I'll bore you all with my latest purchases and some aspects of living in the countryside. To start with the first I got a great deal 8actually it was more of a steal!) at one of the local thriftstores. The first one is a Swedish armyaxe. 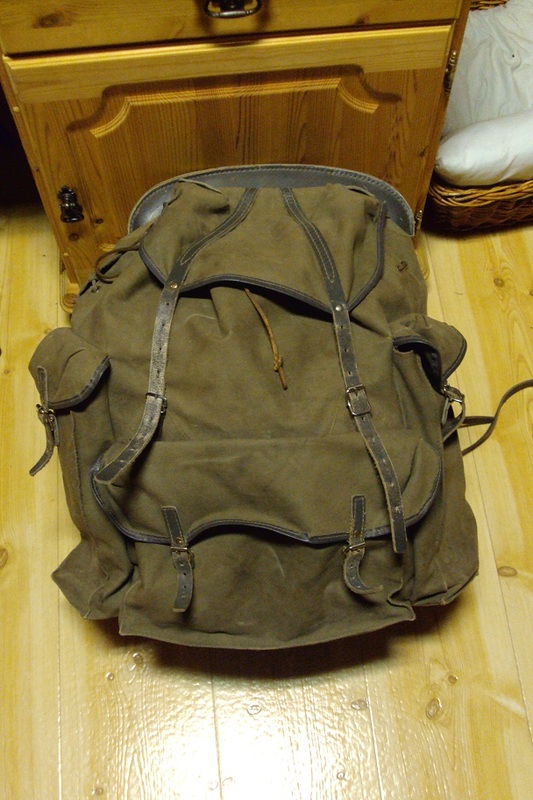 It weighs a total of 2kg and is 55cm long. 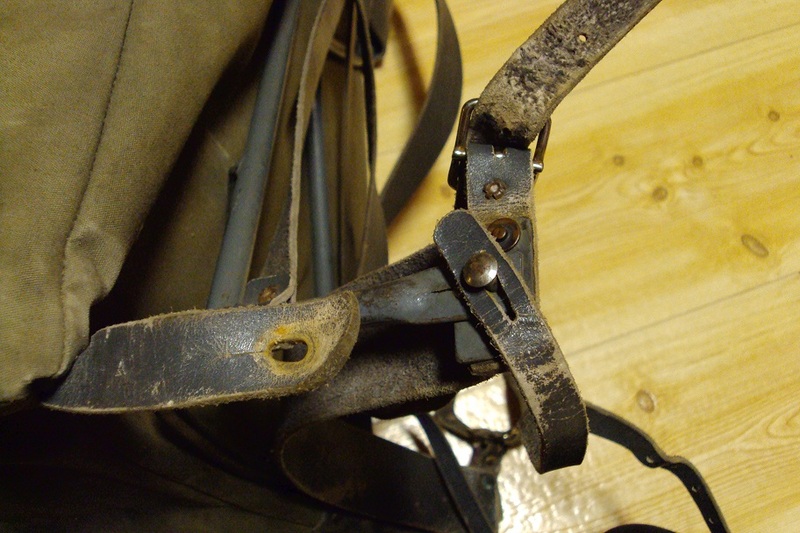 It has a leather cap over the edge, but it also has a hole in the blade and a ring at the back of the shaft! At first I though it was some homemade addition, but all the axes for sale had these features. The straps of the cap ran through the hole, crossing each other there and than ran though the ring, again crossing each other. Than they were tied in a knot, but even without the knot the cap remains in place. 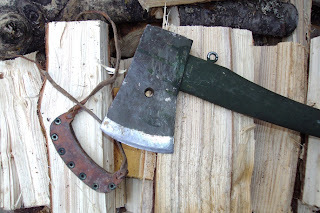 The axe is in prety decent shape, but the leather cap has signs of mold and the leather is dry. 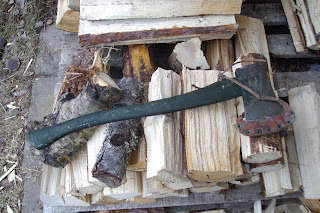 I'll be giving this axe some TLC, sanding the handle to a bare wood, maybe giving the head a patina if it is steel and clean and treat the leather to some wax. 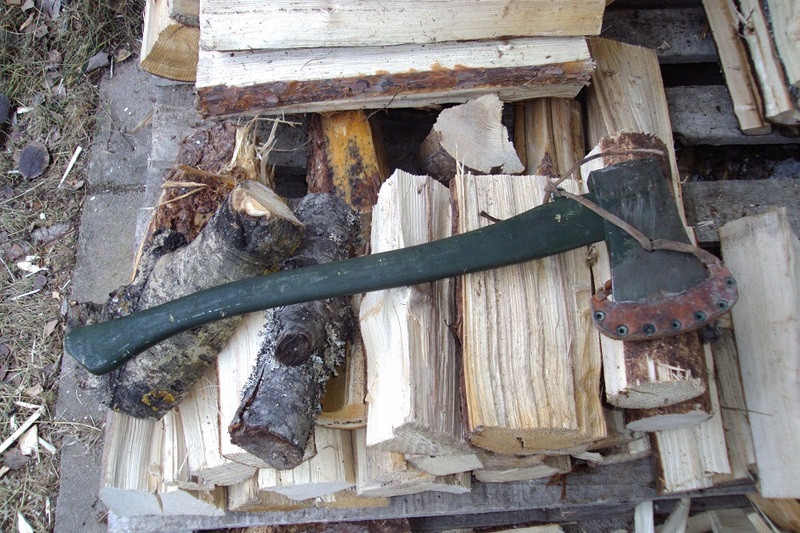 This axe cost me 50sek! 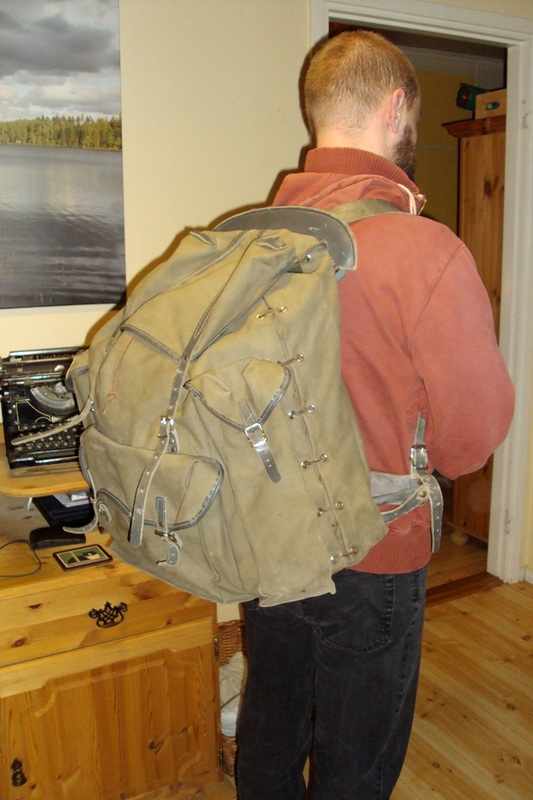 My absolute high for that day was this backpack. 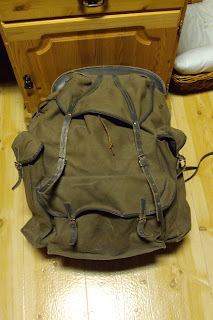 It resembles the Swedish army backpack, but is larger, has 2 long sidepockets and a large frontpocket and some stringing on the sides to allow the main compartment to even expand more. 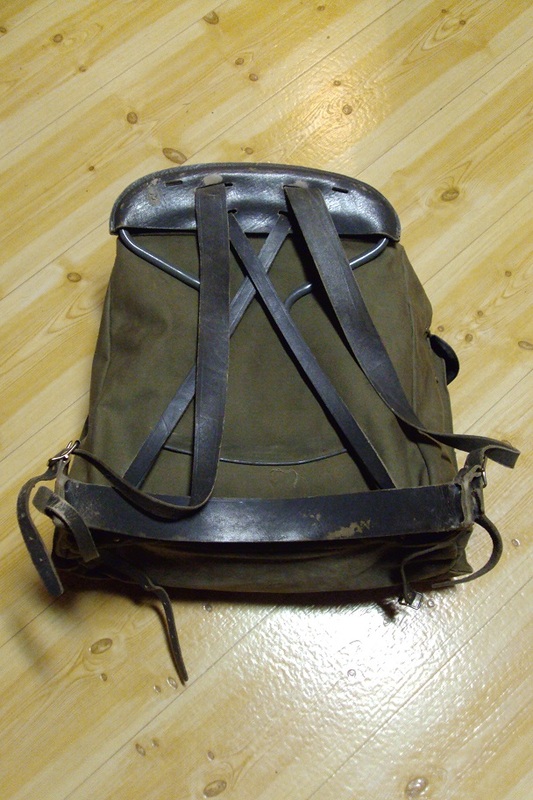 It is made out of a heavy canvas with leather fastenings and a rubberized inner. Asking around on the Finnish bushcraftforum learned that it might actually be an old version of the Savotta 339 saddle sack, but this pack lacks any kind of markings, brandnames or tags and by the looks of it never wore them either. 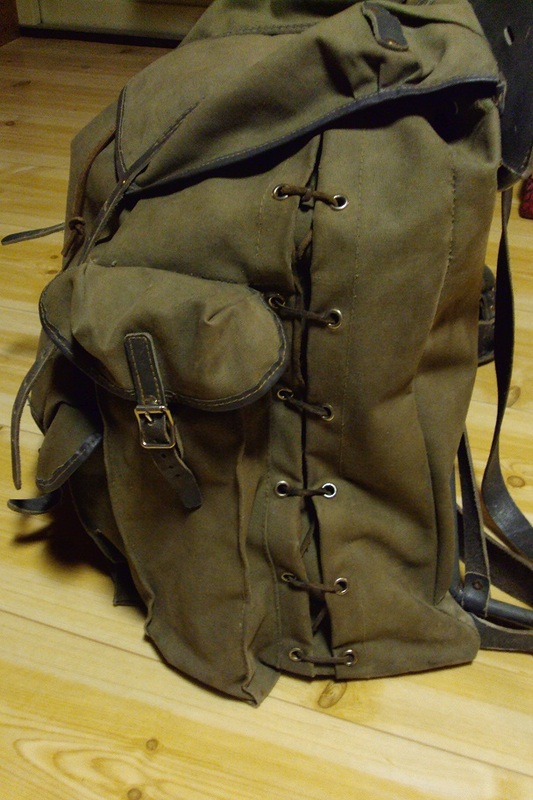 Speaking of looks, this pack looks well used with many signs of wear and tear. One of the closing straps has been replaced and upon examining it I found lots of dust, soil, grass and plantparts in its folds. I could not help but wondering what this pack has been though. 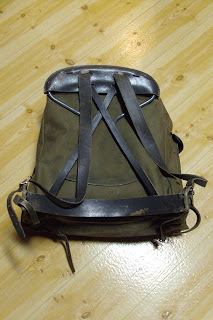 If only it could talk and tell me about its whereabouts and adventures...... And all this for a whooping 10sek!!! I must say that it handled well. The second part of this post is about living in the countryside. For me as a cityboy there is much to learn. One of the basics is actually one of the most basic things done by man; cutting wood! For many this may seem a bit odd and some may raise an eyebrow, but cutting wood does not come naturally!! I had to learn it! And me being me meant that most of the work would be done by hand. Right in front of our house there were 4 hideously disfigured sprucetrees. The previous owner had simply cut out the top of these large trees some years ago, cuasing the trees to form multiple tops and grow even wider. Apart from the fact that they were a sorry bunch to see and that their removal would enhance the visual aspect both from and to the house, there were several other benefits from cutting them down. One is that the bedrooms of my 2 oldest children are exposed to the light of the sun and that means that on sunny days their rooms are a bit warmer. They have rooms in the basement, so a few extra degrees of warmth is welcome, so that these rooms are more comfortable during the day. That also cuts down on heating. Not much, but still. Another is that the wood from the trees will actually be used for exactly that purpose later one; heating. The large parts will end up in the woodfed central heatingsystem and the smaller parts, like branches, will warm our fireplace in the livingroom. 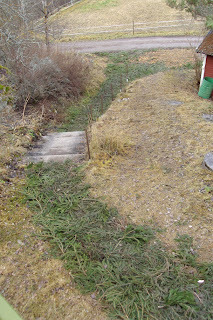 There were also ssome dead treepieces to be removed from the rest of our backyard, as well as a leaning tree, next to the house. It leaned some much over that it actually touched our house and in high winds hit the wooden wall, the roofedge and bathroomwindow. I feared that with a thick layer of snow it might actually break off and cause a lot of damage. So down that went, too. 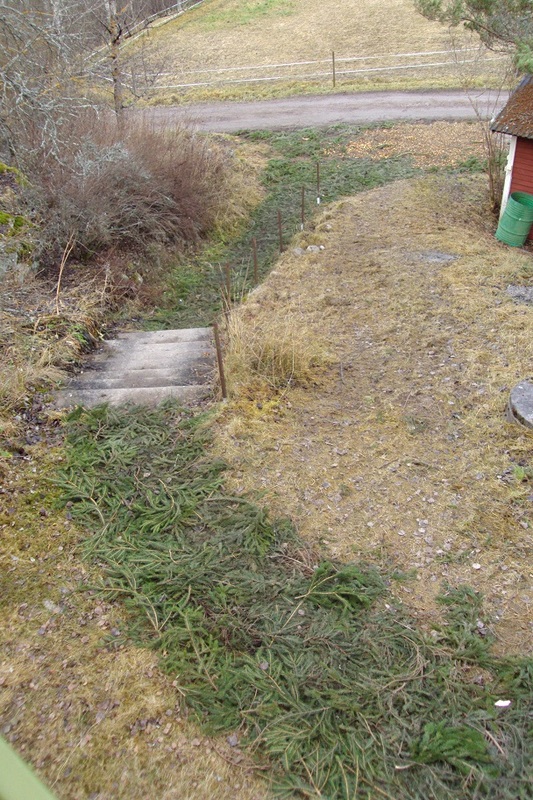 Now that side gets a bit more sunlight and moving air too, which cuts down on the moisture in that part of the garden. I took the trees down, using an electrical chainsaw; powerfull enough, less noicy and certainly better smelling! Unfortunately I had no axes or saws to do it manually. What i did do manually was cutting the branches to size. 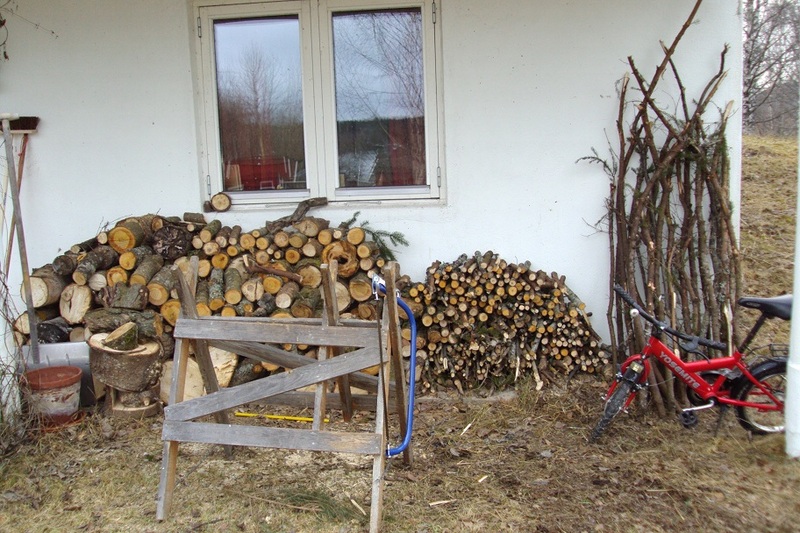 I also started to split some of the wood we had from our previous place. Unfortunately it is too big and too long. Some pieces are larger than 20cm in diameter and measure 50-55cm in length. That is too much for our current heater, so I wanted to cut the pieces down to size making them easier to load and burn. 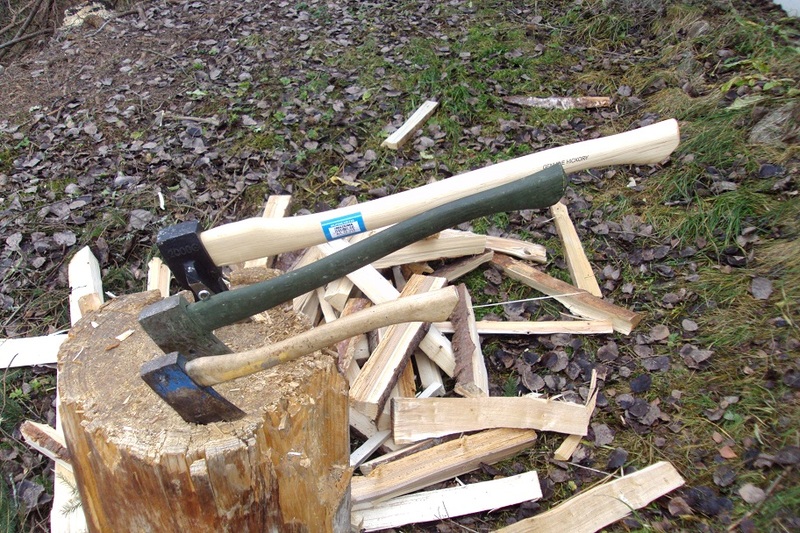 I started to split them using a splitting axe with 2kg head and extra wide fittings on the side. After a while I got the hang (or is it swing?) of it and work progressed nicely. There's nothing like some simple physical work in the fresh air! Relaxes the mind and works out the body. After an hour or so I thought:" hey this is easy. I can do this. 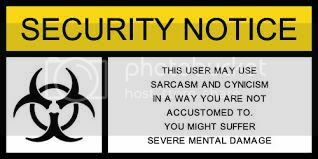 No problem!" And immediately an alarmbel went off. 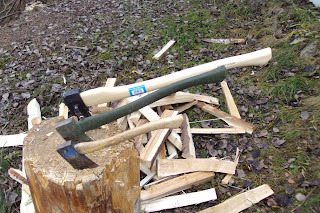 from experience I know that getting cocky or careless leads to disaster, so down went the axe and I took a break. A good moment to line up and show my tools of the trade. 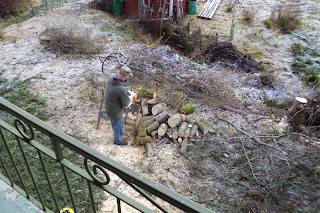 As I stood there, looking at the wood, the axes and cuttingblock, I could not help but think that everyone should at least do this everyonce in a while. It would make people much more appreciative of the modern conveniences we have today and make them waste less resources. It is all too easy these days; just a turn on a switch and the house gets warm. In many cases too warm. There's no need for subtropical temperatures, when it's winter outside. If you get chilly, put on a sweater over your t-shirt. It also reconnects me with the old days. I can still remember when I was a young boy, living with my grandparents, watching them cut wood, in order to get the stove going, befor the coal went in. In those days the kitchen was cosy warm, as was the livingroom, the cellar and hall were cool, but the bedrooms were freezing. I can still recall the feeling of comfort, whenever I entered the kitchen or livingroom, appreciating the warmth. The cold bedrooms made sleeping under woolen blankets heavenly, getting up in the morningcold less so. But it goes much further than that. Doing this kind of work makes me understand the way people lived and worked. I understand why houses were built the way they were and, thinking back to my youth, I again realise why the kitchen was the heart of the home. And finally it gives me a satisfying feeling of achievement, of a hard day's work, that makes sense.